sur 11 décembre 2014 22 décembre 2018 By C. G.
This salad has become a favourite of mine and I always serve it when I have friends over for brunch, and people always love it. It started when I saw a photo on my Instagram feed of a grapefruit cut in half with mint leaves on top. As much as I love grapefruit, I hate eating it that way with a spoon because it always splashes all over. So I decided to make a salad instead and add a little something. 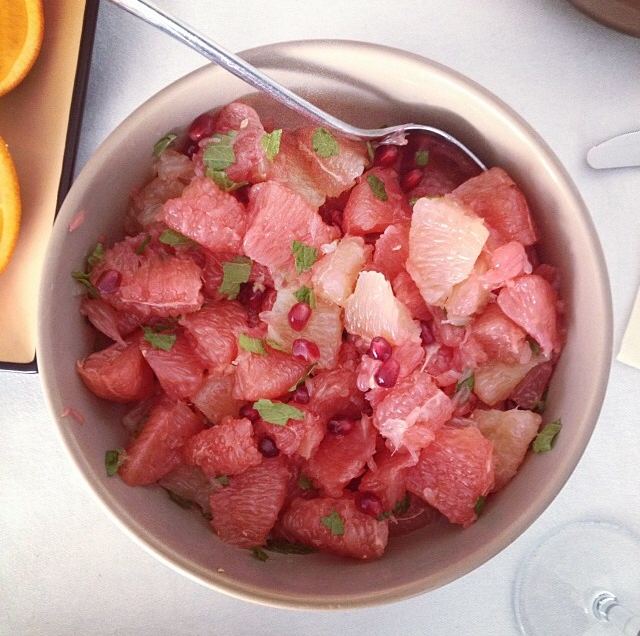 It’s really the simplest thing to make: supreme 3 grapefruits (then cut each piece in half), toss together with the seeds from 2 pomegranates, add some mint leaves and brown sugar, and voilà. Healthy and absolutely delicious!! Je suis sûre que tu ne seras pas déçu!